Well built, economical, easy to use. Quite small - check to see if it's big enough for your needs. 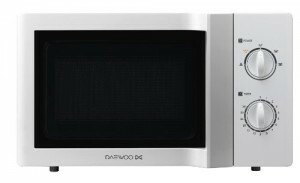 The white Daewoo KOR6L65 solo microwave is a small but incredibly easy to use solo microwave. Overall capacity is just 20 litres, but it provides a substantial 800w of power output on the highest of the five settings provided. Both the mode and timer are set by turning the two large dials - these are well labelled, and easy to operate - if you're looking for a microwave for an elderly relative, then this model is well worth considering. The top dial sets the mode, and the lower dial sets the time period, which goes up to a maximum of 35 minutes. 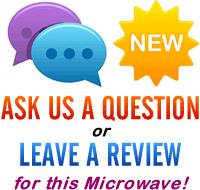 As such this microwave is probably not ideal for those who wish to slow cook food for longer periods of time - however for users who just want to be able to cook and reheat food, then it will be ideal. Realistically this microwave is a bit too small to be considered for larger families, and being a solo microwave, it doesn't feature a grill nor a convection oven facility. However if you're looking for a small yet reliable microwave that is easy to operate, then this model from Daewoo is well worth considering. The Daewoo KOR6L65 is ideal for workplaces, small families, and elderly users alike. The Daewoo KOR6L65 is cheap, very easy to use, and works well. A little on the small side, but ideal for smaller families and households.